Train to Busan is perfectly titled. I mean, the film does predominately take place on a train bound for Busan, but more than that, it speaks to the film’s pace. It barrels forward, with a relentless velocity, sticking to its pace and never stopping for relief. It mixes Romero’s political or cultural commentary with Danny Boyle’s decision to make them fast moving and those bitten rapidly transformed and creates a film that stands up to analysis and works as a fast-paced, tension-filled action/ horror exercise. We open with one of those chemical spills that always seem to be causing some kind of trouble before we’re introduced to our predominant leads, Seok Woo (Gong Yoo) and his estranged young daughter, Soo An (Kim Soo-An). He’s a hedge fund manager, who has neither the time nor the interest in being a father. As a birthday gift, he decides to take his daughter to Busan to see her mother. We see a stumbling, convulsing passenger, with an ominous bite to the leg, climb on just before the train’s doors close. She transforms into a zombie, bites an attendant, who in turn bites others. Within minutes, the surviving passengers find themselves surrounded by ravenous hordes, and they must move from train car to train car to stay alive until they can reach a safe destination, even as reports of other outbreaks are overheard. Narratively, the film has some redundancy. You can only watch characters think they’ve reached safety only to find the destination hosting a massive number of zombies so many times before it feels a bit cyclical. The setup lacks originality as well. This is basically Dawn of the Dead, except with a mobile mall. What distinguishes the film involves its characters and writer-director Yeon Sang-Ho’s ability to milk every possible drop of suspense and tension from a familiar setup. Train to Busan never pauses long enough for the film’s action to become monotonous. It’s a series of continually escalating set pieces that could leave a viewer in a state of exhaustion if the film wasn’t so entertaining. And it is. It’s a blast. 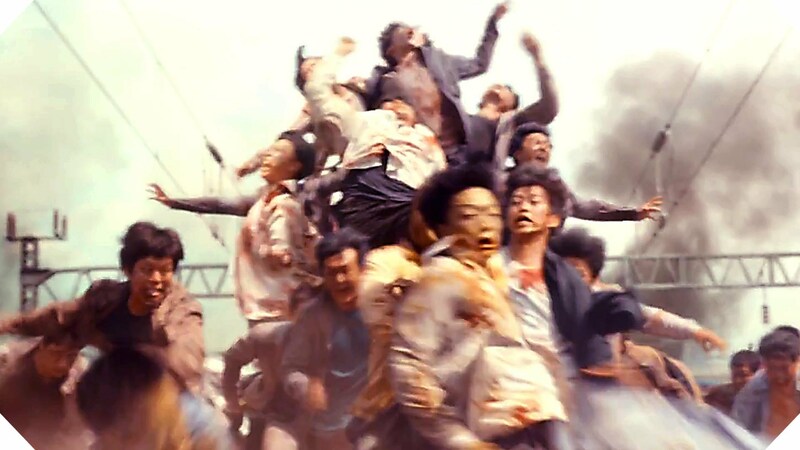 My tolerance for zombies has waned in the era of The Walking Dead, but Busan reminds me of the zombie film’s effectiveness. They’re the epitome of a mindless horde, capable of surrounding you and turning you into just another mindless killing machine. They exist as one of the few monsters whose sense of terror stems from their numbers and scope rather than their monster identity. Busan gives its characters pack after pack, which leaves the viewer in near-panic waiting for the next onslaught. When the killings start (and continue), they’re gleefully gruesome and gory, guaranteed to leave a smile on any gorehound’s face. Yet, the film wouldn’t really stand out as anything more than an above average zombie flick were it not for its well-developed characters and its underlying message regarding the importance of looking out for others when disaster can spring from behind any door. The majority of Busan’s characters work for the betterment of the group rather than self (except for one particularly sniveling character who ultimately feels more villainous than the throngs of rapidly approaching zombies). As a result, when a character dies, it stings. There’s an actual sense of loss that accompanies every character we come to know when a zombie transformation occurs. The film also gives its characters some time to grieve, which adds a melancholy layer to a film that’s a surface level adrenaline rush. While Seok Woo’s journey from disinterested father to devoted caregiver lacks novelty and unpredictability, the film gives the developing bond between him and his daughter a huge dose of heart and sentiment. If you find yourself emotionally moved by the film’s events, you wouldn’t be alone. It’s rare for a film with zombie swarms to also be labeled thoughtful and emotionally involving, but Train to Busan manages to pull it off.